This gorgeous Sherri Hill prom dress 52951 features a deep sweetheart neckline with thin spaghetti straps and an elegant mermaid silhouette. 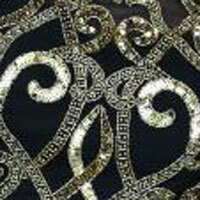 The metallic gold print really stands out and is sure to have you captivating everyone's attention. What an outstanding choice for this years prom, find your perfect fit at www.promdressshop.com today.